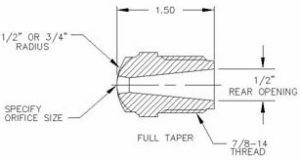 Huge selection of nozzle tips for your injection molding application. We carry a large variety of orifice sizes in 1/2″ and 3/4″ radius and also 10mm and 15mm metric radius. 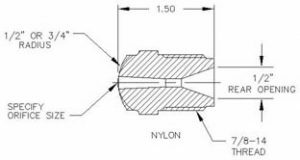 Choose from General Purpose, Nylon and Full Taper nozzle tip designs to best suit your process. Common orifice sizes are also available in extended tip and beryllium copper tips. 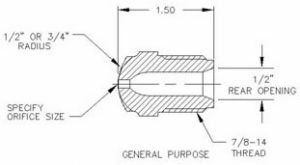 We can expedite a special order nozzle tip in a few days if necessary.